NEW BRITAIN - It was a start Mark Hamburger will want to put quickly behind him - and quickly. 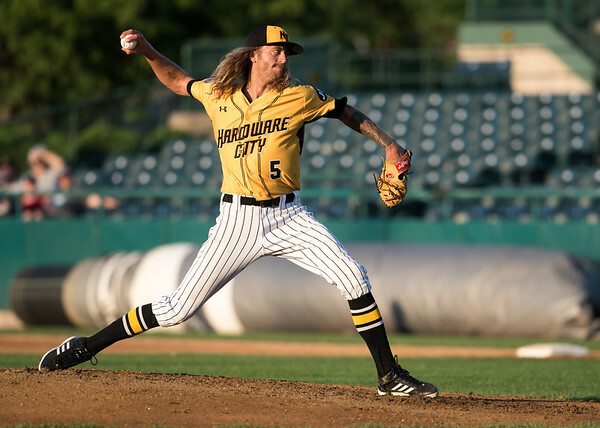 The New Britain Bees right-hander last just four innings on the mound Wednesday afternoon, giving up seven runs (five earned) in the team’s 7-0 loss to the Sugar Land Skeeters. It was Hamburger’s second shortest outing of the season and has now given up at least six runs in four of his last five starts. The Skeeters got to Hamburger early, scoring their first four runs of the afternoon before the sixth batter in their lineup even stepped to the plate. Barrett Barnes led off the game with a home run. It was the first of two for Sugar Land in the inning. Matt Chavez delivered a two-run shot four batters later to follow a Courtney Hawkins’ RBI single. The Skeeters tacked on three more runs in the fourth, two of which were hardly the pitcher’s fault. Two batters after Juan Silverio hit an RBI double to score Albert Cordero, an error by New Britain shortstop Vicente Conde allowed Silberio to score. A passed ball then brought in Alvaro Rondon. The Bees, meanwhile, collected eight base hits, but went 0-for-4 with runners in scoring position. New Britain’s best chance to bring a runner home came in the third inning on a Jason Rogers’ double, only to have Conde thrown out at the plate to end the inning. Posted in New Britain Herald, New Britain Bees on Wednesday, 25 July 2018 16:55. Updated: Wednesday, 25 July 2018 16:57.